Damsons, bullaces and cherry plums can be regarded as the semi-wild cousins of plums. They are small plum like fruits which are mainly used making jam and cooking. Once popular and widely used, these have now become one of our almost forgotten traditional fruits. They are rarely if ever seen in shops and supermarkets. The only way to have them is to either grow your own or pick them in hedgerows or from the wild. They are very easy trees to grow and will do well and crop heavily in almost all parts of the country. We have listed below some of the most popular and our recommended varieties. You can see the full range by clicking on the relevant links below. Click here for a guide to choosing damson, cherry plum and bullace trees. 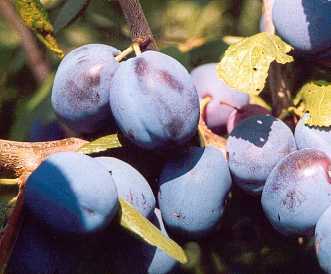 The name damson is thought to have been derived from damascene plum, in other words plum of Damascus. However the link implied by this name to the Middle East is rather tenuous. Whatever its origins, the damson has become a very traditional British fruit. Its distinctive bitter-sharp flavour and intense purple colour is unique. It makes the most wonderful jams and jellies as well as traditional products such as damson cheese and damson gin. Damson trees are very hardy and grow well throughout almost the entire country. They have a naturally bushy growth habit. Please find below 6 of the most popular and recommended varieties. We can offer a total of 8 varieties - click here. Our local variety. A heavy cropping popular small fruited damson. 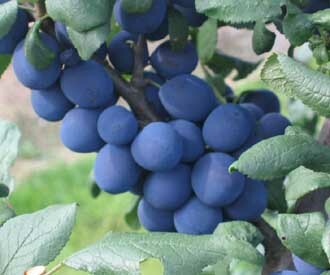 A very popular large damson regarded by some as a small plum with damson flavour. 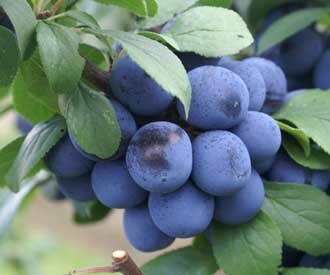 A classic damson considered to be one of the best flavoured. Bullaces are little known small round wild plums. The trees resemble damson trees in many respects. The fruit colour can be a purple damson colour but varies and can also be a pale yellow. The fruit is in clusters, almost like tight bunches of grapes. It is mainly for culinary use. 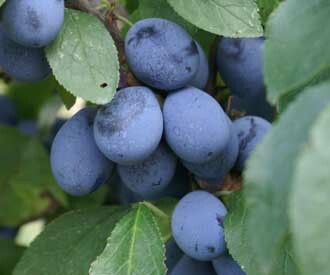 Bullace trees are hardy and can be grown throughout almost the whole country. Please find below 3 of the most popular and recommended varieties. We can offer a total of 4 varieties - click here. A small almost black fruit good for jams. 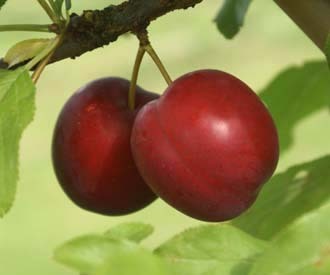 Cherry plums are related to plums. The fruit is smaller, often heart-shaped and ripens earlier than plums. The fruit colours range from green and yellow to purple. They can both be eaten fresh or used to make jams and jellies. The trees have smaller more delicate leaves than plums and produce a profusion of white blossom in early spring. 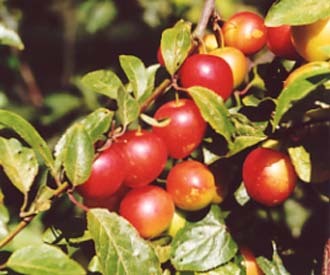 The mirabelles are golden yellow round cherry plums which are very popular in Continental Europe, particularly France. Please find below 4 of the most popular and recommended varieties. We can offer a total of 10 varieties - click here. 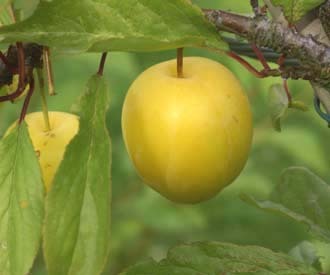 A golden yellow cherry plum which is good for eating fresh as well as cooking. The most popular mirabelle. 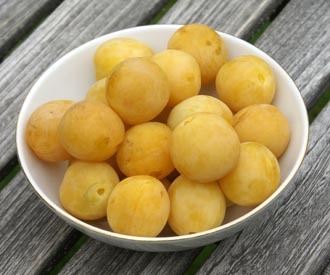 Mirabelles are small sweet plums very popular in France mainly for cooking and jam making.